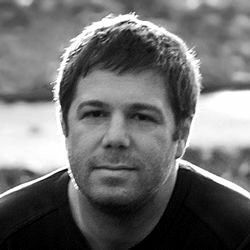 We, townies and urbanites, absorb the familiar ambience of outdoor spaces around us; local parks, street trees and private gardens evoke innate perceptions of natural landscapes. Increasingly, many of us get to cherish the sun and sky perched in lofty landscaped roof terraces, where design and build challenges are formed in sheer dichotomy to those on terra firma, and although roofscapes are usually flat, sited among strident urban settings, we seek to embrace and energise their environments. 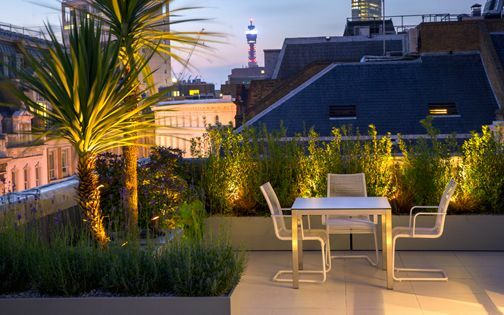 Rooftops rarely undulate or contain substantial ground depth for planting, while typically inaccessible to most wildlife, yet, in our urbanscape, a well-designed roof terrace conveys fluidity between its residence and contiguous city landscape. 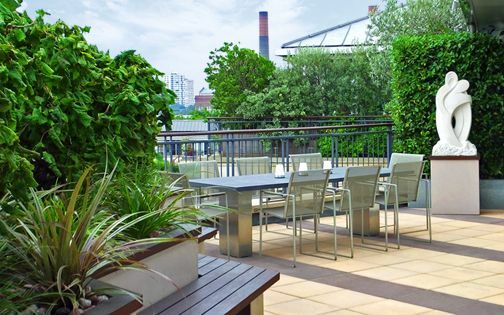 Work access into many rooftop terraces is at times fairly complex, where managing projects efficiently requires profound insight of their design & build process to sustain liveable and well-constructed roof terrace gardens. The sky is an inherent, prevailing constituent of many roof terraces, and at times defines their most aspectual characteristic, providing an expansive backdrop where sculptural elements are uniquely elevated under urban skylines. Selective colour palettes, discreetly embedded within roof terrace design frameworks, blend harmoniously into ever-changing skyscapes, enhanced by daylight nuances, as well as night-time silhouettes, remoulding core integrants continuously. 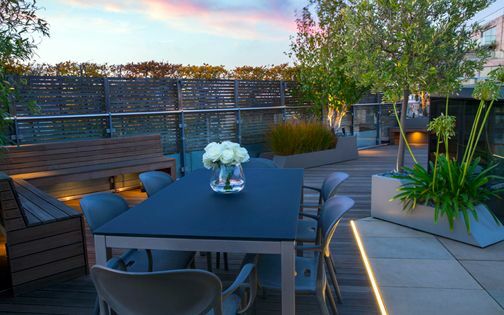 Embracive, skyward roof terrace gardens, thoughtfully designed and built, engage seamless colour spectra – augmenting city living while reciprocating with London's atmospheric changeability and aerial subtleties. 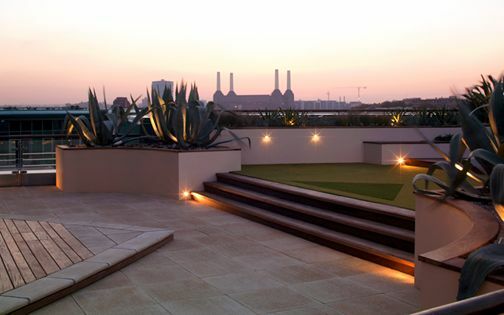 In Greater London, where much of the city's fabric is formed with solid architecture, we often plant multi-stemmed trees to complement geometric, structural outlines effectively, and when a rooftop terrace is skilfully lit at dusk, its architectural flora is amplified to portray a renewed outdoor setting. The myriads of roof terraces situated along River Thames' banks encompass a larger reflecting expanse, as wild blue yonder merges with sinuous water, forming voluminous scale. 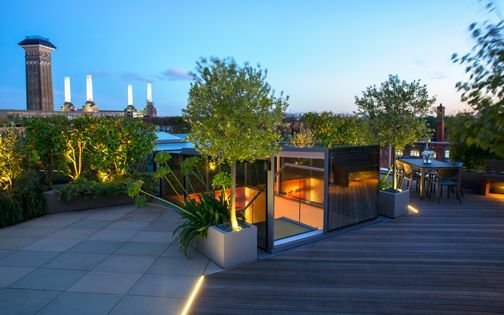 This unique prospect entails sky roof garden designs which embrace their surrounding urban landscape and engage soothing scale. Countless rooftop terraces are constantly open to the elements, enduring gusty winds, where we select plants sustainably for their distinct ability to thrive in these tricky, lofty conditions. Small-leaved species perform effortlessly in a windswept environment, while silvery foliage is readily effective in warm sunrays; their resilience even more pivotal amid an increasing wind tunnel effect within densely built-up pockets. 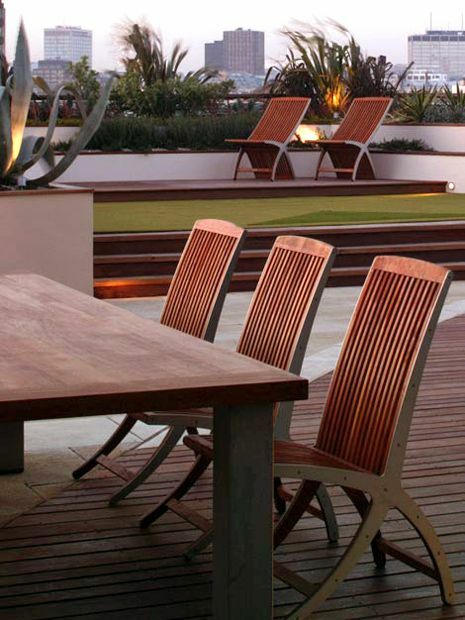 Furniture and lightweight objects are securely integrated into roof terrace design frameworks to minimise movement, and we create anti-topple devices for planters, ample shelter for seating zones and diverse heating sources. Regular maintenance is naturally essential, curbing pollution impact in urbanised areas, where wind and rain recurringly migrate impurities which tarnish surfaces and walls. Discovering the most efficient access route is a challenging yet rewarding aspect of designing and building a roof terrace project in London. 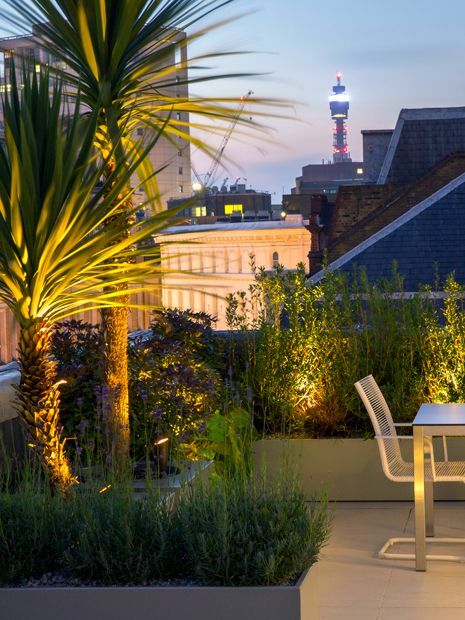 Before we commence a new roof terrace garden design, we survey what's feasible to import into a site, such as oversized deck boards, tall trees and large planters. The building's lift is a logical starting point, while stairways are practical up to certain heights. An external, compact furniture lift forms our modus operandi in busy London turnings, although parking bays typically need reserving in advance. 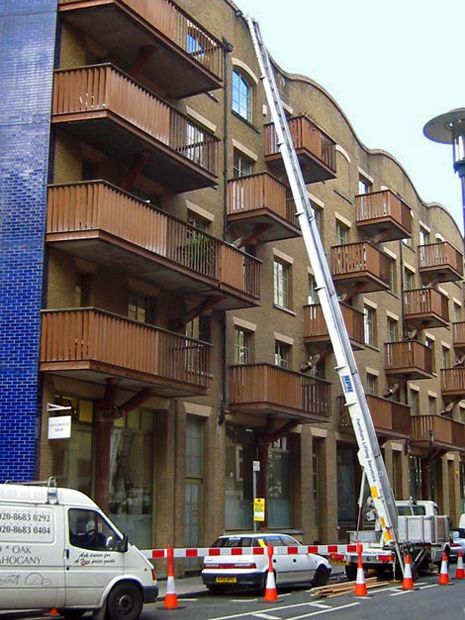 We hire cherry pickers and mobile cranes as a last call, when the items we require are heavy, and the top floor too high to reach. Solving a logistic dilemma in a roof terrace project entails greater diversity, and on-site tweaks inextricably steer the scheme towards fresh, alternative design & build solutions. Sunny roof terraces provide optimal conditions for Mediterranean floras which effortlessly endure relentless wind, heat and drought. Arbutus, Eucalyptus, Olive, Laurus, Palm, Pine and Vitex trees, along resilient Birch and Ginkgo species, withstand pollution – enhancing contemporary, architectural rooftop designs all year round. 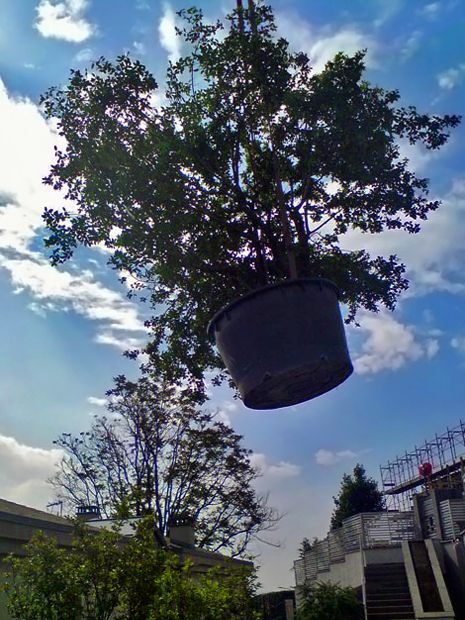 Given the abundance of specimen plant nurseries and furniture lift hire services around Greater London, we create instant scale by utilising verdant architecture, where sculptural plants produce the contours pivotal in linking a rooftop landscape consistently into its urban backdrop. Constant wind patterns considerably affect roof terrace ambience, where architectural specimens contribute sheer balance by sustaining clear, steady outlines alongside dainty movement of grasses, herbs and low-lying perennials. This continual, invigorating foliage interplay generates renewed energy which elevates roof garden dynamics in a breezy microclimate into thriving settings, while preserving modern terrace design methodologies and their integrated foliar qualities. These robust terrace frameworks are rarely associated with wildlife friendliness, yet a structured flora make-up enables creating more intricate, diversely sustainable wildlife garden sanctuaries, amid urbanised growth and its diminishing natural resources. 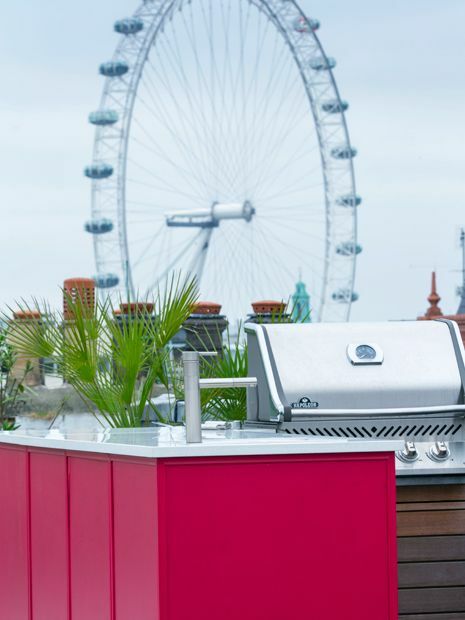 New-build rooftop terraces around London benefit from steel and concrete frameworks, enabling substantial weight to be loaded. In various converted buildings, however, it's best to consult a structural engineer to ascertain how much further weight can be added and how it should be optimally distributed. In contemporary roof terraces, the weight's bulk is loaded along peripheral edges, and while bodies of water are integrated, such as weighty pools and spas, their structural design aspect requires consideration at a project's inception. We plan ahead when designing and building a rooftop terrace, since we know its weight is gradually increasing, while roots, foliage and branches multiply, and following long rainy periods, the compost doubles its weight too. Snow load, live load and dead load, you name it – just leave it to the capable hands of a structural engineer! 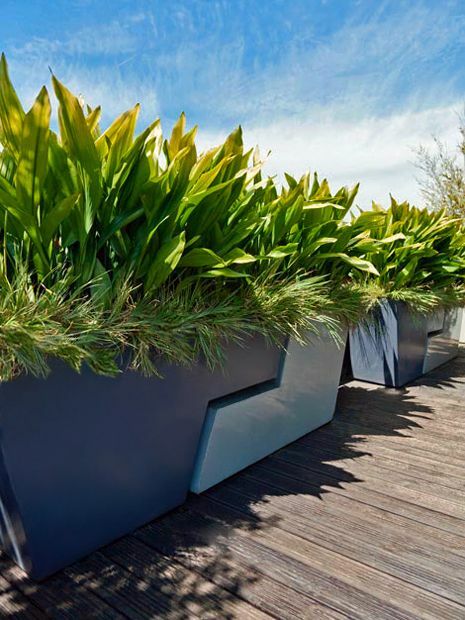 Sizeable planters form pivotal cultivation elements across modern roof terraces, sustaining stable platforms for plant growth. 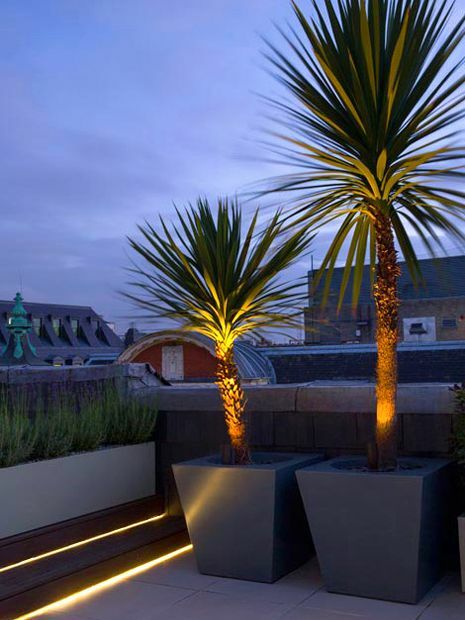 When a rooftop design entails tall planters, we devise anti-topple devices at their back elevations, secured to walls or balustrades. 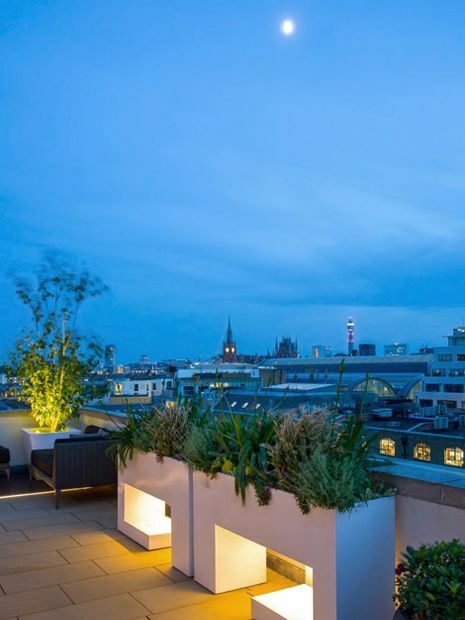 In London, where an ever-changing skyline provides continual inspiration, the prospect of designing further roof terrace fluidity, merged with its backdrop, is extensive – articulated via unique, one-off planters. 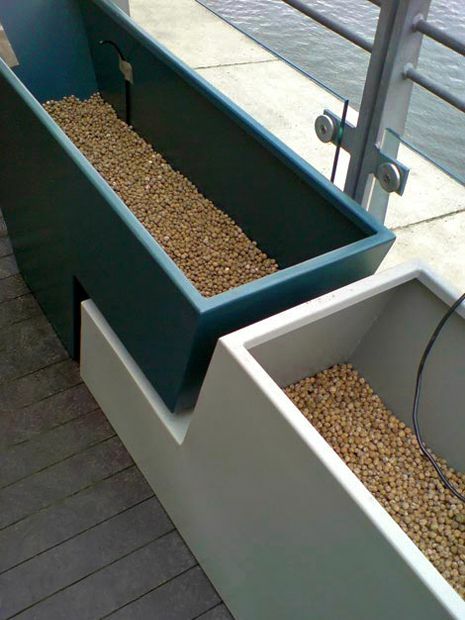 Although we utilise built-in raised bed methods within roof garden projects, when site conditions are apt, we often include discrete planters which optimise schematic flexibility, reduce weight, ease logistic constraints and celebrate truly architectural roof terraces. In many inner-city roof terraces, where outdoor space is markedly limited, plant cultivation is condensed into free-standing vessels – wholly redefined by diversifying growing media with custom-made planters, troughs and containers. We develop new forms to mitigate this rudimental dilemma, and extend our design & build repertoire through juxtaposing suitable plants in optimal spots – deploying bespoke planters. This architectural design approach is central in personalising contemporary urban terraces, while fusing concise expressions of innovative techniques with hands-on construction. Copious lightweight drainage material such as Hydroleca is ideal to include below planting compost, where these volcanic clay granules are indispensable in assuring warmth for plant roots, porosity and reduced weight, while minimising clogged outlets. Drainage for roof terrace planters is pivotal in maintaining vigorous plant growth, and since limescale continually gathers on rooftop surfaces, tarnishing their appearance, we position drainage at the reverse elevation of planters and containers, rather than at their base, while diverting excess water elsewhere via a discreet pipework. Designing adequate drainage within roof terraces is not only essential for thriving and efficient cultivation, but also for producing pristine, contemporary high-rise roof garden exteriors all year round. Automatic irrigation saves time and water, paramount in sustaining plant growth on roof terraces, and its suitable programming during the change of seasons optimises rooftop planting schemes. 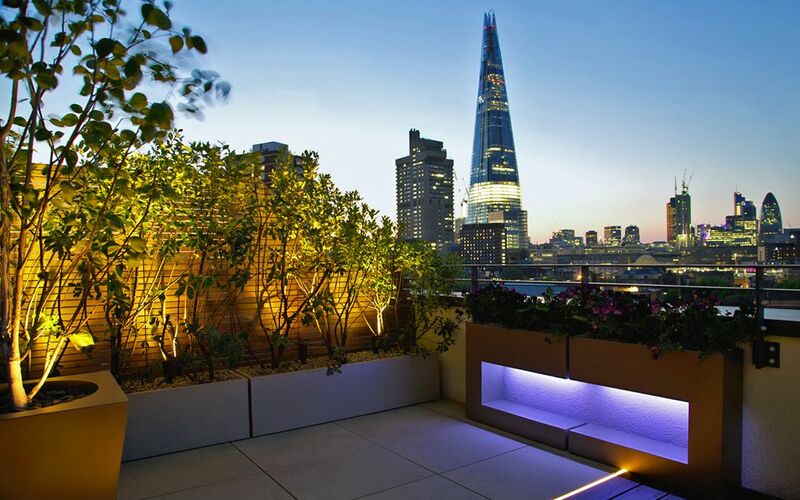 Numerous London roof terraces feature a deep overhang detail, where rainwater doesn't reach covered areas, while constant wind depletes moisture from foliage. Well-watered roof terraces maintain robust vegetation, even in the most extraordinary weather patterns and environmental urban contexts. Prior to commencing a concept for a new roof terrace design & build project, we assess watering sources and the viability of alternative solutions in the absence of an existing supply. Soaking plant roots thoroughly and regularly is crucial, particularly when flora is juvenile, and as plants mature, the watering intervals should increase steadily, since green vascular systems process further moisture, transferring it to branches, roots and leaves. Nutrients in compost dwindle too, and drip irrigation, with its wonderful cycles, is central in performing essential feeding tasks. Roof terrace irrigation upkeep is straightforward, such as replacing batteries annually or varying the periodical, programmable settings. Yet, London's hard water clogs sprinklers repeatedly, where occasional descaling of irrigation nozzles is certainly worthwhile to maintain vitality. In wind prone locations, roof terrace furniture requires fastening, as too lightweight, it'll become a hazard in stormy weather and vanish! When there's no view from the residence into its rooftop, stackable chairs are preferable, fixed securely while not in use. If it's feasible to include sizeable items, solid furniture is especially functional across roof terraces both visually and for peace of mind. Utilising covers is handy as well, since debris accumulates due to polluted rain, wind and bird antics. Great furniture enhances penthouse garden designs, and when vistas are truly awe-inspiring, while sunbeams glisten, this platform positively transforms into the home's most enjoyable hub. 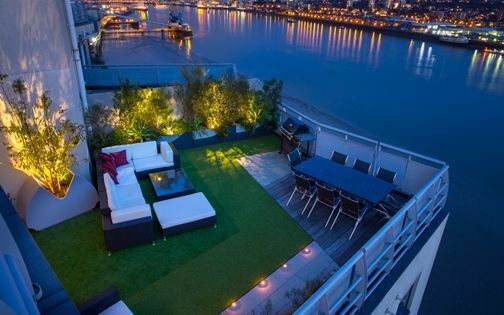 To be a Londoner and design roof terraces is to grasp the landscape of this metropolis by creating uncluttered green silhouettes to frame significant landmarks, and entirely transform rooftop ambiences. 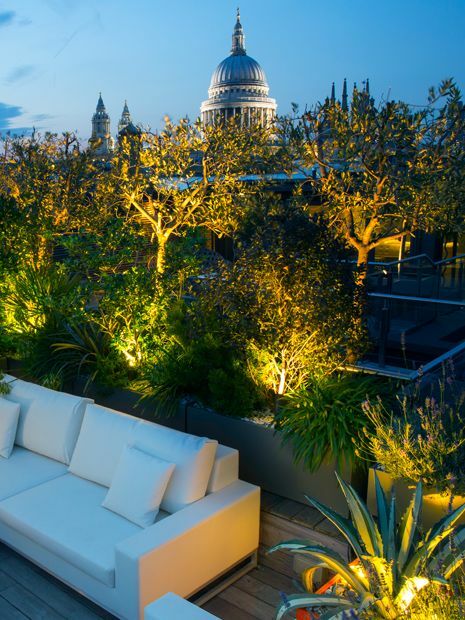 We produce an immersive roof terrace experience by preserving extensive vistas, and providing adequate room along the perimeter to soak up city landmarks. We reproduce contiguous outlines in a roof terrace's backdrop to enhance continuity with refined, custom-made planters and suitable architectural plants, which increase perspective spatially and sympathetically, while integrating pivotal living frameworks. Our 40th floor Barbican roof terrace and its expansive panoramas encapsulates the entire London city skyline to provide a phenomenal aerial study encompassing a millennium of epic landmarks, from the dome-shaped roofs of O2 and St Paul's Cathedral, to London Eye's circular aperture and Sir Norman Foster's Gherkin's and City Hall's distinct curvature. While designing in proximity to neighbours who enjoy the same view, we reciprocate, and acknowledge the shared vista of our clients and their adjacent properties sensitively in our roof terrace designs. As the saying goes: the view is everything, but sometimes we have to live under the same roof! 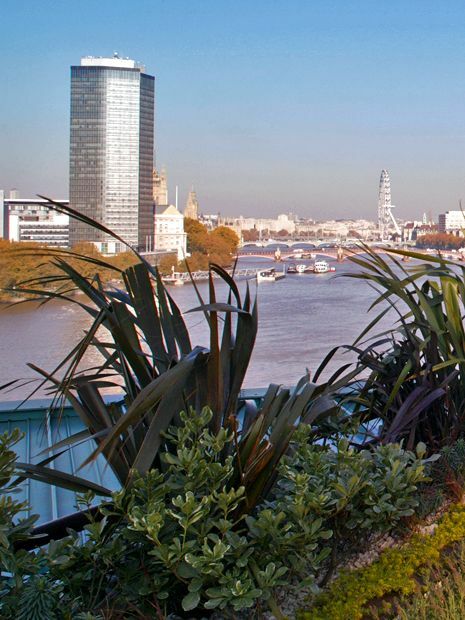 When we designed a new roof terrace in Butlers Wharf for the first time, the experience of landscaping an outdoor space beside Tower Bridge left a lasting impression. There's an enthralling aspect amid proximity of iconic, historic landmarks within a contemporary roof terrace in the way they affect character and ambience emphatically. 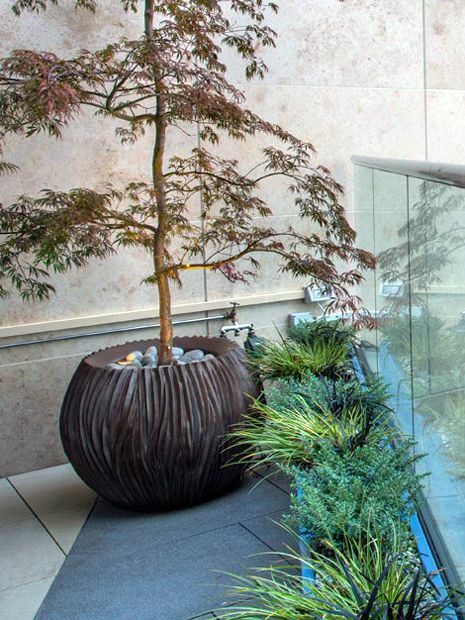 An effective roof terrace design & build project generates alternative topography, raised upwards from a flat surface, where layered foliage, split levels, focal points, integral seating, tree positions and sculpture are paramount in guiding the eye along a roof terrace sequence. One of the finest thrills of designing a London roof terrace is to produce immersive vantage points to soak up the capital's landscape vistas, and while developing rooftops abundant in landmark views is indeed an urban privilege, these terrace gardens engender another art form altogether – a seminal class of novel roof garden design principles!